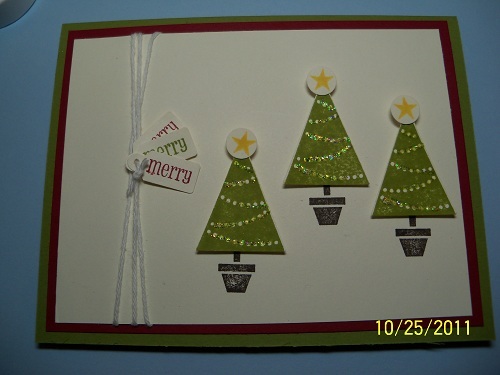 There is still time to stamp a few Christmas cards! 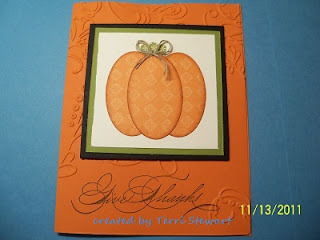 I’m offering buffet-style stamping this week, on Wednesday and Friday evening. 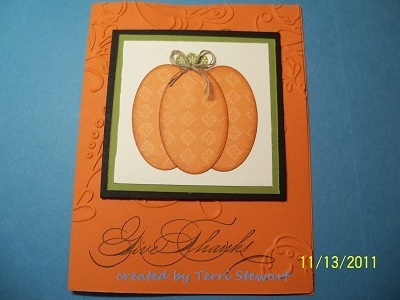 Stop in and make a few cards. The menu below shows what’s on the buffet; see attached photos for samples of each. 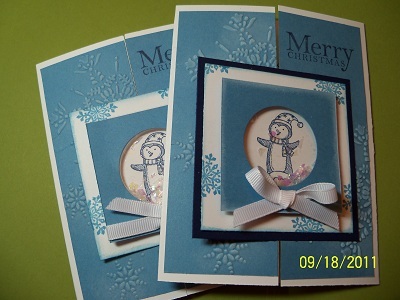 Cost to stamp these cards is $6 per set of three and includes envelopes. 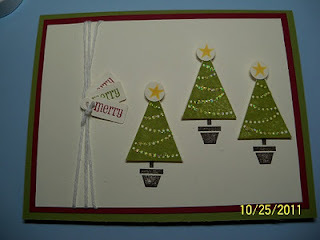 Looking for a cute way to give a gift card? I have the perfect idea—it’s a combination of gift card holder and chocolate nugget box! I’m giving a class on Saturday, December 3rd, from 3-5pm so you can make these cute gifts. 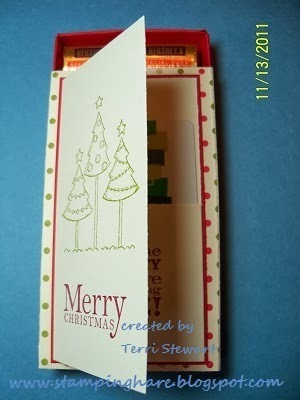 Cost is $5 per holder and includes 10 wrapped Hershey’s nuggets. Invite a friend or two! Don’t forget the Online Extravaganza sale continues through midnight on Wednesday, November 30th; the sale includes a variety of items on sale, with between 20% and 60% off sale items. To learn more click here. Place your order online and you can include items from the clearance rack with your order. I love a bargain! Also, I have 2 new stamp clubs starting in January. I’ll share photos of some projects soon. 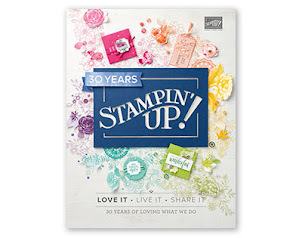 This is your chance to learn new techniques and use the newest stamp sets and embellishments. Plus, club members receive instructions for all club projects. These girls night out offer lots of creative fun! Contact me now to save your spot! 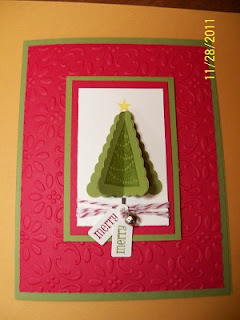 Stampin Up has annouced a sale starting at midnight on Monday. November 21 through November 30th. 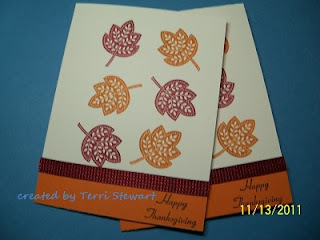 Details about what is on sale will be available on my Stampin Up website at http://stampinhare.stampinup.net/ beginning midnight November 21st. The other exciting news is there will 2 items on sale just for one day only, Monday November 21st. No details have been shared on what the 2 items are...sorry, but I am anxious to discover what might be, too!! I'll post more details on Monday. A few cards I made to send to a few special people in my life....I am thankful for the people in my life, they make my life far richer than I could imagine. These are super cute and too easy to make! I wanted to share a few ideas I have for gifts that can be shared with friends during the holidays. These are super quick and have lots of Wow. ENJOY! I whipped up 20 of the snowflake pillowboxes in a little over an hour; inside I placed 2 Ghiradehli chocolate squares. Yummy! 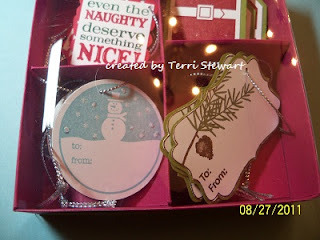 Gift tags, especially the hand-stamped variety, make an excellent little holiday thinking of you gift. Last year, I gave a gift card to my daughter's bus driver...this year I'll be using these gift card holders. Super quick to put to together AND super cute!